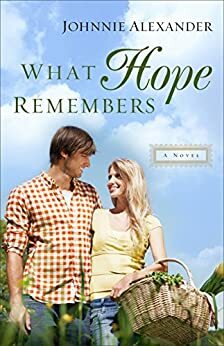 "What Hope Remembers" is book #3 in Johnnie Alexander's Misty Willow series and another excellent story! Amy moves back to be near her brother Brett and she is seeking to find the peace that Gran had at Misty Willow. This is a place that has turned Brett and AJ's lives around; however Amy has her doubts, especially when Gabe shows up on the scene as well. Gabe has served his time for being in the wrong place at the wrong time; however this continues to hang over him and he cannot seem to shake his past. Johnnie does such an incredible job of bringing the characters to life, I loved both Gabe and Amy, plus all of the other characters. It felt like coming home to spend time with the characters once again from the first two books. Misty Willow is such a homey setting as well that it even more so feels like a return to home and an escape from the busyness of everyday life when I sat down to read this book. The themes of returning home, new beginnings, and forgiveness were all nicely portrayed in this story and I am eager to see what Johnnie writes next! He has an unusual gift for relaxing his customers and stimulating their desire to reveal more than they planned. By the completion of their ride, many feel so comfortable that they confess their sins great and small. Antonio's faith guides his discussions and points him in new directions. Suddenly, his peaceful world is turned upside down by a mysterious business woman. As she heads to a midnight rendezvous, she confesses more than Antonio can handle. Her story sends him into a world of espionage, international terrorism and danger. David L Winters is an award-winning author, humorist and speaker, originally from Ohio, who lives in the suburbs of Washington, D.C. His first book, "Sabbatical of the Mind: The Journey from Anxiety to Peace," won several awards including a Silver Illumination Award from the Jenkins Group and two Finalist Medals from the Next Generation Indies Book Awards. David L. Winters is an author that I will be following as "Driver Confessional" is an intense, action-filled read from start to finish. Antonio is merely trying to make a living to pay bills and support his family. He is used hearing his clients spill their secrets as they share stories in his car. However, one night, one ride, one person spilling secrets leads to so much more as a dangerous web results. This is such a good read and applicable for this time as there is political unrest and espionage as a main theme in the story. Antonio is an upstanding, Christian man who shares his love and faith with his passengers, and a family man; it is impossible to not like him and not root for him. This is only book #1 in the series and I am looking forward to getting to know Antonio better as this was a nice window into his life and into Antonio as a main character. This is a great start to the series and I highly recommend this to those whom enjoy suspense. offers a user-friendly guide to the Bible's biggest ideas. I wasn't sure what to expect with this book, how it would be laid out or what all would be within the book. Deron has divided this book into 40 chapters, each chapter focusing on a section of the Bible, beginning with the very first chapter of the Bible, Genesis 1, and stressing just how priceless each of us are, as we are each made in God's image. The Biblical text is shared at the start of each chapter followed by a discussion of the passage and personal application. I found this book to be eye-opening as far as some of the common passages of the Bible, but having them approached in a different way. I love the messages and insights from Biblical scholars, historical figures and others included in this book as well. I would recommend really taking your time reading through this book as there is so much included and so much self-reflection and study that can be done. "Trusting Grace" is the 3rd book in Maggie Brendan's Virtues and Vices of the Old West series. This is such a sweet story and I really enjoyed the storyline and the characters. Grace has always longed to be a mother, but her husband has passed away and they had not had any children. Grace is also having to care for the farm and her elderly father. This is not the life she has dreamed of for so long. Robert was in for a shock when his wife passed away and he finds out she had children. Robert is overwhelmed and shocked to say the least and puts up a wall against falling for another woman and experiencing these type of feelings again. Maggie does an excellent job with creating the scene, I felt as if I was out in the west living life running a farm. Seriously, I felt as if I were actually there and part of the book. Grace is definitely a favorite character of mine, although I have loved every single book of Maggie's that I have read, there was something about Grace that really warmed me to her. I am sad to see this series end but excited to read whatever comes next! "The Whole Thing Together" is a brand-new read from Ann Brashares. Years ago I read Ann's Sisterhood of the Traveling Pants series and loved it, so I was thrilled to see that she had a brand-new book out! This is the perfect beach read for this summer! "We live in the same place, but never together" is the line on the back of the book and aptly sums up the story, but also is a great opener to it as well. Sasha and Ray had never met face to face but they lived in the same home, on varying weeks and weekends, sharing the same space, making memories, but always separate. Even though they share older sisters and have attended the same family events, their parents were always careful to plan out everything so their paths would not cross. Now it is time to clean out the beach home and part with this home, this house that has been home to so many. I loved this book! Ann's characters are so relatable and she writes with such emotion that it is easy to get lost in the characters' lives and in the story. This is a great book that addresses family, what makes a family and issues families must cope with. I highly recommend this book to be placed on your summer reading list! To learn more about Ann, go here! First of all, this cover is amazing, I love everything about it, the details, the colors, the lighting. Then you open the book and start reading and Judith has done an amazing job with the story and characters as well! 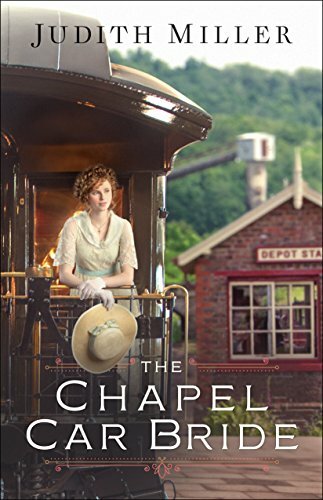 "The Chapel Car Bride" is an excellent historical romance read with some mystery and adventure mixed in as well. Hope has lived a sheltered life and is thrilled at the opportunity to join her father when he takes a position with the railroad and she is able to see more of the world and have adventure. This book helped fill the gap right now of being in between seasons of "When Calls the Heart" as it is the mining town and the miners and the living conditions in this community. I felt as if I was back in Coal (Hope) Valley. I found the chapel car and being a missionary on the rails such a unique storyline, it was fresh and different and thoroughly enjoyable. I highly recommend this for anyone whom is a fan of historical romance! It's the exciting start of a brand-new series by a contemporary romance fan favorite! Becky Wade is one of my must-read authors, I have to read every book of hers as soon as it's available, every single one is that good! "True to You" is the first book in her brand-new Bradford Sisters series. However, Becky wrote a prequel novel to the series, "Then Came You," that I highly recommend. This novella is the story of the Bradford Sisters father and their mothers, and it is so unique as it is filled in various forms of correspondence between the various characters and through Garner's journal entries. "True to You" focuses on the middle Bradford sister, Nora. Nora whom is sweet, serious and single and agrees to volunteer on a Saturday morning with her younger sister and meets John Lawson. John is a former NAVY Seal and when he learns that Nora is a genealogist he enlists her help. As the two work together they are complete opposites but seemingly a good team at the same time. I loved this story! I also loved the bits and pieces about the other sisters whom will each have their own stories (hopefully sooner than later!). Becky does such a great job with creating characters who I cannot help but love, but I can also picture completely and empathize with. I highly recommend this book to contemporary romance fans! "Never Enough? 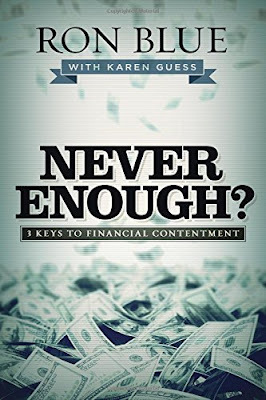 : 3 keys to financial contentment" is an excellent book for anyone who feels like they need a fresh approach to their finances and where their money is going. Ron Blue and Karen Guess do an excellent job with presenting the key points to this book. The principles are very straight-forward and simple and the authors add in stories to further explain and really get the points across. I love the pie chart that is utilized showing how money is divided (should be divided) and paying careful attention to the size of each wedge in the pie. I really like how the "give" section is discussed and how we are encouraged to make this a bigger wedge of pie as we all learned as a child "God loves a cheerful giver." In all seriousness, giving to our church, giving to missions, having a giving heart is important and will be rewarded and needs met. This book is such a great read and a great reminder and also new tidbits to think about as far as how I approach money and how I need to reprioritize things. God knows you're beloved; do you? Find out in @BlumLee's new book, Brave is the New Beautiful! Our culture bombards women with "thinspiration" messages and pressure to "do it all" while wearing the mask of perfection. "Brave is the new Beautiful: finding the courage to be the real you," by Lee Wolfe Blum, is an excellent read for each and every woman who feels like she cannot do it all and is feeling overwhelmed with all the pressure to be perfect and do everything. Lee shares personal stories and stories of women she has met whom are choosing to be themselves, rip off the masks they are hiding behind, a perfect front that they are putting on to the world and those they interact with in their everyday lives. One of my favorite sections (one of many!) in this book is: "I think the journey to discovering our true identity is one we walk our whole lives. Our understanding doesn't always unfold in the time frame we'd like, but God is always at our side, urging us onward, holding us close to him." This is just one part that jumped out at me and I read it again and underlined it. This is such an inspiring book that has me thinking about who I am, who I want to be and who I present to others. I love the questions for reflection at the end of each chapter, for personal thought, but also to discuss with others. 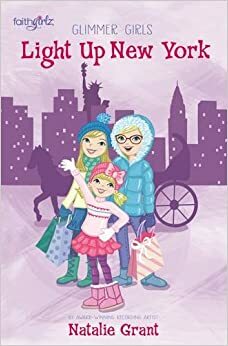 Guest Book Review Post: "Glimmer Girls: Light up New York"
I am Kristie's daughter Allessandra. I am 8 years old and in 2nd grade. I love to read and write stories, I want to be an author when I grow up! The story Light up New York was about that the Glimmer Girls were going to New York City. The Glimmer Girls were VERY exited about going to New York City. The people that were coming were: Mia, Maddie, Lulu, Miss Julia, the kids' Dad, and the kids' Mom. Also, Mia said when the kids were in the car, she said: "watch your elbows Lulu''. So, that part of the story told me that in the car, the kids were quite uncomfortable. Then, they got there! Then, they made plans for what to do. "Solve a mystery!" Lulu shouted. Dad gave Lulu a serious look because sometimes when the Glimmer Girls do mysteries, they get into trouble. The family planned: to go to the Library, the Museum of Art, go ice skating, see the Statue of Liberty, and the Dad said to find a perfect cup of coffee. Lulu is very funny because when the family went to the Hotel, the family saw there was snacks in the Lobby, the Mom said: "at least we know there is snacks in the Lobby." Then Lulu said: "midnight snacks!" Then the Mom said that how about an apple or granola bar because the family knew that Lulu meant junk food. Then, that is all I can tell so I DO NOT ruin it for some people. Enjoy reading! 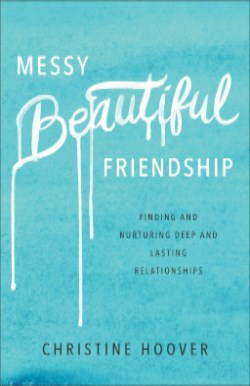 I really enjoyed Christine Hoover's book, "Messy Beautiful Friendship: finding and nurturing deep and lasting relationships;" it is a great book filled with so many little tidbits of wisdom. Friendships can be so tricky, as women we are wearing so many hats and balancing so many roles in our lives. We are overwhelmed with responsibilities and frankly, just exhausted at times and little time left over for friends, social things, free time. One of the chapters that really spoke to me was about opening our hearts and our homes. We are worried that we don't have time for friendships, or our homes are not clean enough or our children well-behaved enough. Christine encourages that we be a back-door friend, someone who is not presenting ourselves in a certain way, really not presenting ourselves at all, just being ourselves, letting our friends see the smudges, the weariness, who we really are. At the end of the book there are also questions included to discuss with other friends; I love this addition to the book. There are also several verses included at the end that discuss friendship as well that gives a Biblical perspective and reinforces Christine's writing. This is a must-read for anyone who is seeking to build her friendships and really have deep meaningful friendships with other women. Melanie Dobson has written another amazing novel that is filled with historical details and wonderful characters. "Catching the Wind" tells the story of a few different individuals during different time periods. Daniel and Brigitte escaped from the Gestapo in Germany, but were separated when they arrived in England. Daniel has spent the last 70 years trying to find Brigette and he seeks help from Quenby, a journalist. Quenby and Lucas, Daniel's lawyer, team up to search for Brigette, as she is fascinated by her story. Melanie does an incredible job with this story as she ties together individuals from different decades and weaves together the time periods and their stories. World War II is a time period that I have read a lot about and one that I enjoy, and Melanie brings a unique spin to things so it is all a brand-new story to read. I cannot imagine the horror that Daniel and Brigitte saw and suffered through. It was easy to get lost in their lives and in the story. I loved Quenby's role in the story as well and she was an easy character to like. This is a must-read book for historical fiction fans and one with a gorgeous cover as well!